You might be surprised to know that Mints make spelling errors on coins, but it happens, and it used to be surprisingly common. Since the days when the first inscriptions (often called legends) appeared on coins, errors were bound to creep in, and they did. In the early days of coin production, in ancient Greece and Rome, dies were completely hand-engraved from start to finish. One would expect a master craftsman to take care and pride in producing error-free work, but all humans are prone to errors, and engraving coin dies day after day must be quite repetitive and boring work, so it would actually be surprising if some errors did not occur. Also, because of the number of hours needed to produce a die, Mints would be reluctant to scrap a completed or near-completed die. Sometimes errors went unnoticed, at other times, it may have been possible to hide or mask the error, by re-working over the error. As the author, I had to admit that it suddenly occurred to me that I did not know when the first puncheon was used to prepare the working die for a coin. At times like this, Google and Wikipedia are often my first ports of call, but neither produced a definitive answer. I then found that our office CD-Rom copy of the OED objected to running under XP, preferring Windows 98 or NT. Resorting to the hard copy version revealed the fact that an early written use of the word occurred in 1375. Even so, this does not start to address the question of when sub-punches or punchlets were first used. The reason this is relevant is that, if the die engraver has a set of punchlets to hand, the process of die production becomes easier and less labour intensive. the corresponding problem is that it must be far easier to pick up a wrong punch than it is to erroneously produce the same error by hand engraving. A set of punches for letters and dates would cut down significantly on the time needed to produce a working die. A quick telephone call to the Royal Mint Museum found an answer to my question. Puncheons with partial designs were first used very early in the history of coin production, probably about the 3rd or 4th century BC, or even earlier. Our thanks to the Curator. 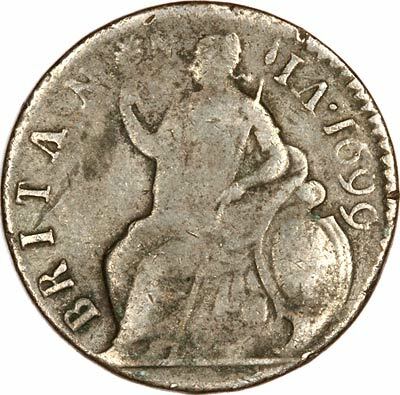 On the reverse of our featured coin, it can fairly clearly be seen that the word BRITANNIA has been spelled with inverted letter V's instead of A's. It must be an easy mistake to make, and possibly the error was never noticed at the time. It is also likely that it only occurred on one single die, out of many used for the production of 1699 halfpennies. 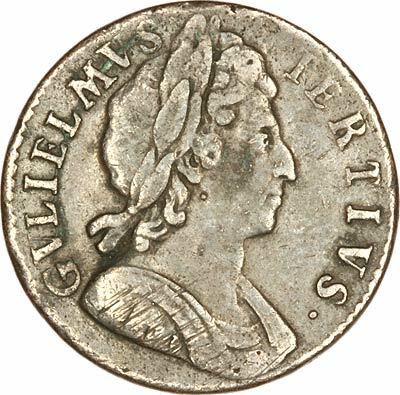 Around this time, many coins were produced with similar errors, particularly in the legends. This would ultimately have been allowed due to insufficient supervision or quality control, couple with the use of semi-skilled, or semi-literate, engravers and die-sinkers. It also tends to have been more common on minor coins rather than on major denominations, for obvious reasons. Our Spink catalogue lists over 30 errors in 7 years of William III halfpennies, if we include variations in punctuation also. For the last few centuries, much of the labour has been taken out of die production by reducing machines, working on pantographic principles, and in the past few decades by laser and computer technology, so that the use of puncheons plays a lesser role in the production of coin striking dies. All Change - George Brown says Uncool Britannia must go.